LGBT viewers can find much to relate to — and fear — in the supernatural new Netflix series. The child protagonists of Stranger Things — a Netflix series about supernatural happenings in suburban Indiana in the 1980s — have many foes to fight, among them a sinister government entity and a bloodthirsty creature from another dimension. But for the everyday humans in the suburban town, the monster they encounter most frequently is homophobia. In fact, nearly every episode of the eight-part series contains an antigay slur or an act of bullying aimed at characters who step outside the borders of heteronormativity. There are no obviously LGBT characters in Stranger Things, which was created by Ross and Matt Duffer (Wayward Pines). But one doesn’t need a Hays decoder to ascertain that every character the audience roots for is queer in some fashion. Their status as outsiders resonates for LGBT viewers, and the slurs used to describe them — “perverts,” “fairies,” “queer,” “weirdo” — sound all too familiar. Byers is branded queer due to his quietness and his class — he and his divorced mother (Winona Ryder) live in far less suburban opulence than his tormenters, who later spray-paint “Byers is a perv” on a wall. But the young boys at the center of Stranger Things are the most frequent targets of persecution. Bullies in their middle school call them “freaks” and harass them for being attracted to science and fantasy role-playing games. Their physical otherness is also mocked. Dustin (Gaten Matarazzo) lisps due to a condition known as cleidocranial dysplasia — he’s missing his adult teeth. Another member of their group, Lucas (Caleb McLaughlin), is African-American — one of the few observable black people in this town. The tormenters are uniformly white. The bullying becomes especially ugly when a member of this group, Will Byers (Jonathan’s brother), disappears — the inciting incident in Stranger Things. “He was probably killed by some other queer,” one bully tells his friends. The bully was repeating what his father had told him, tapping into an enduring myth of LGBT people as monsters and pedophiles who seek to abduct and murder children. Throughout the series, this particular bully becomes a mouthpiece for homophobia. He repeatedly uses antigay epithets to describe the missing boy and devalue his life. Referencing queerness, the bully laughs at the thought of the Will’s death at a memorial service conducted by the school. “What’s there to be sad about anyway? Will’s in fairyland now, right? Flying around with all the other little fairies, all happy and gay,” he says. His homophobia does not go unpunished. In response to these cruel words, a character with supernatural powers, Eleven (Millie Bobby Brown), uses her gifts to shame the bully in front of the school. Seething, the bully plots his revenge, attempting what is essentially a hate crime later in the season. Eleven, the true central character of Stranger Things, is a queer avenging angel. Her mysterious powers allow her to fight against her oppressors — almost uniformly men, or “mouthbreathers,” as she once classified them. Her otherness is rooted in her pain. Through flashbacks, the audience learns that she was separated from her family as an infant because she was different from the others. Until escaping from her government overseers, she was locked up and tortured because of her identity. Eleven is also gender-nonconforming. Initially seen with a shaved head and wearing a hospital gown, she is repeatedly mistaken for a boy. She later wears the clothes of one of the boys who find and befriend her. This is shown to be problematic when, in one scene, the group contemplates her appearance as an obstacle to bringing her out in public. "There’s no way we’re gonna get the weirdo in there without anyone noticing," said Lucas. "I mean, look at her." In order to avoid attracting attention, the group costumes her in a pink dress, a blond wig, and makeup borrowed from one of their sisters. “Pretty,” Eleven says, looking at herself in the mirror, a concept that is later redefined when, yes, the wig comes off and true selves are revealed. There’s also the matter of what the characters call the “Upside Down,” an alternate dimension where the monster lives. 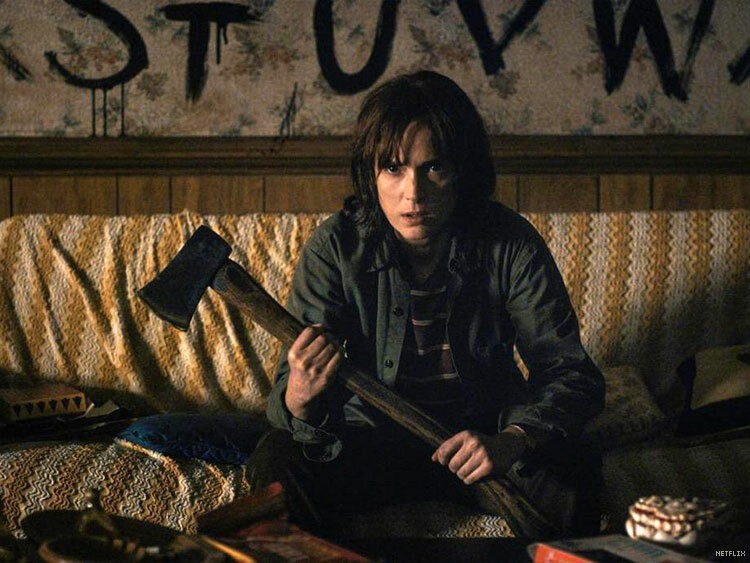 Characters who are outsiders — Will as well as Barb, the “unsung and forgotten hero” of Stranger Things, as Vulture dubbed her — are dragged there and left to die. It’s a dark, cold, and lifeless version of the real world, and a potent metaphor for the closet. Stranger Things is a vision of suburban America in the 1980s — and a science fiction one at that. But the hatred and bias lurking in the background here are still very real for many young people today. Just change the channel to any Republican debate, and see the real monsters at play.